KANNAPOLIS, North Carolina (May 17, 2018) – Aric Almirola and the No. 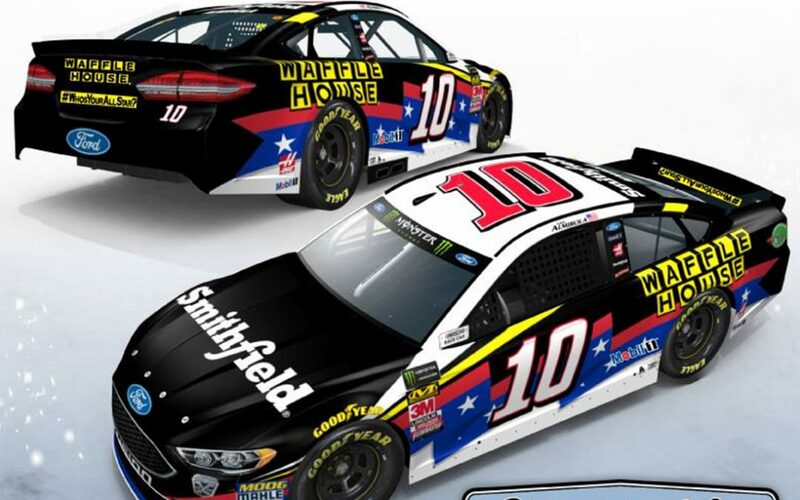 10 Smithfield/Waffle House Ford Fusion team for Stewart-Haas Racing (SHR) will venture just a few miles down the road from the race shop for Saturday night’s Monster Energy All-Star Race at Charlotte (N.C.) Motor Speedway. While this weekend is an exhibition race, the No. 10 team is riding the momentum from last weekend’s race at Kansas Speedway in Kansas City after qualifying fourth and taking the checkered flag ninth. Aric Almirola will attempt to make his second career start in the Monster Energy All-Star Race by either winning a stage in the Monster Energy Open that precedes it, or by garnering the most fan votes. Almirola hasn’t finished outside the top-10 in a Monster Energy Open non-points race. In his lone All-Star Race start in 2015, he earned a 14th-place finish. For this weekend’s non-points race, Waffle House joins Smithfield on the No. 10 Ford Fusion. The Norcross, Georgia-based restaurant is teaming up with Smithfield to launch its “Who’s Your All-Star?” sweepstakes. Beginning Saturday, customers are encourage to take a photo with their favorite Waffle House associate and post them on Twitter and Instagram using the hashtag #WhosYourAllStar. One grand prize winning customer and associate will each win a VIP experience at the Ford EcoBoost 400, NASCAR’s season finale in November at Homestead-Miami Speedway. Ford has a series-best seven wins this season, with six of the victories coming from the SHR camp – Kevin Harvick with five and Clint Bowyer with one.